What a clever piece of metafiction this little gem is, with surprise layers only discovered after reading the book, then investigating it thoroughly, turning it over, finally understanding how it works. 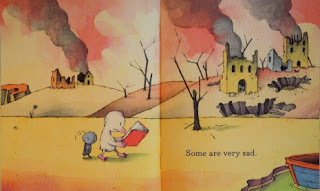 But this understanding is not necessary for enjoyment of it, with it scute little duckling and bug characters celebrating books. I mean, just look at that front cover, grey text under the title and cover illustration, that doesn't make sense if you just look at it like this, you don't realise until it's been read front to back that the story inside the book, is being told here on the cover. 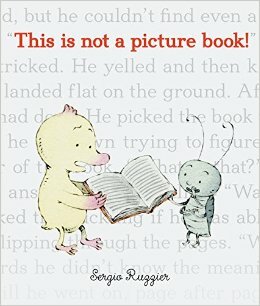 Rules are broken, we have two double-page spreads of story before we get to the title page - Duckling finds a book, but there are only words in it, something he's never come across before, then the title "This is not a picture book!" Bug arrives a few pages later and asks if Duckling can read it, Duckling isn't sure - Duckling and Bug stand in white space but there's a log across a chasm to a coloured world with odd looking things in it - the perfect visual depiction of the learning-to-read experience. it all looks foreign until you gain some understanding. As they move on the pictures reflect their discoveries. 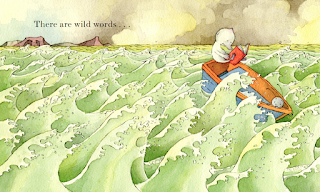 ... and so on, the wonder of words celebrated with quirky watercolour illustrations rich with emotion, humour and communicate the joy of making pictures in your head when you read an un-illustrated text. Which brings me back to those mysterious end papers, resolved when you get to the back of the book to find the whole story written in text, now in perfectly readable English, and we realise that t the front pages echo the experience of the beginning reader who might only recognise a few of the words. So clever and so simple all at once. And then there's my favourite illustration near the end - a gorgeous bookshelf stretching the width of the duckling's bedroom, loaded with books - picture books and otherwise no doubt.